Analysis: Elliott was scheduled to become an exclusive rights free agent, essentially locking him in for another year in Philadelphia even before Friday's agreement. The 24-year-old kicker has converted 83.9 percent of field-goal attempts and 93.5 percent of PATs through two seasons, including 19 of 21 from 40-49 yards and seven of 11 from 50-plus. Given his attachment to an above-average offense, Elliott makes sense as a low-end kicker option with some upside in the final round of 2019 fantasy drafts. Analysis: Including the Eagles' two playoff contests, Elliott was generally solid during his second NFL season, as he converted 27 of 32 field-goal tries (84.4 percent) and missed only two of 38 point-after attempts. The 23-year-old will become an exclusive-rights free agent this offseason and will almost certainly be tendered a contract for 2019. Analysis: Elliott again put his team in a precarious position by missing the extra-point try after the Eagles' first fourth-quarter touchdown that left them with just a 13-point advantage. He more than made up for it, however, as he punched a 35-yarder in to win it as time expired. The Memphis product also made a 47-yard attempt in the contest and has not missed from inside 50 yards since Week 7. Elliott will try to keep that streak intact with the Eagles' playoff hopes on the line Week 17 at Washington. Analysis: Elliott missed practice Thursday but made it back Friday, apparently making good progress in his recovery from an illness. He'll be fine to handle the kicking work Week 16, facing a Houston team ranked fifth in the league for points allowed (20.1 per game). Analysis: Elliott was unable to practice Thursday because of his illness, but it appears he was feeling good enough to get back on the field Friday. That puts him back on track to suit up for Sunday's matchup with the Texans. Elliott didn't practice Thursday due to an illness, Daniel Gallen of The Harrisburg Patriot-News reports. Analysis: Some type of flu bug was already afflicting Eagles wide receiver Alshon Jeffery, who missed a second consecutive practice Thursday. 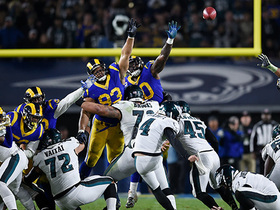 There's no telling if Elliott is dealing with something similar, but a teammate (reserve LB Kamu Grugier-Hill) kicked field goals in his absence, so the Eagles may be confident the issue is short term in nature. Friday's injury report will reveal Elliott's chances to suit up Sunday against the Texans. Elliott (undisclosed) wasn't present at practice Thursday, Zach Berman of The Philadelphia Inquirer reports. Analysis: The reason for Elliott's absence wasn't immediately known and may not be revealed until Thursday's injury report is posted. In Elliott's place, backup linebacker Kamu Grugier-Hill was seen kicking field goals Thursday, so perhaps it's a positive sign that a teammate rather than a newcomer is filling in for the second-year kicker. Elliott made three of four field-goal attempts and all three extra-point tries in Sunday night's 30-23 win over the Rams. Analysis: Elliott's night started promisingly enough, as he nailed a 51-yard attempt to open the scoring in the first quarter. 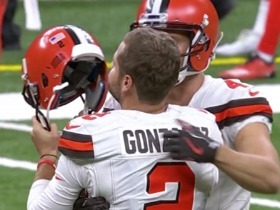 The 23-year-old made two shorter attempts in each of the next two quarters, but he missed from 53 yards out with a chance to ice the game late in the final period. The Memphis product has now missed field-goal tries in back-to-back games and will try to right the ship at home Week 16 against Houston. Elliott made his lone field-goal attempt in Sunday's 29-23 overtime loss to the Cowboys but connected on just two of three extra points. Analysis: Elliott's first scoring attempt of the game came after Alshon Jeffery's third-quarter touchdown, but the Memphis product pushed it right. He would tie the game at nine early in the fourth, but perhaps the contest would not have gone to overtime if not for the missed kick earlier. Elliott has had to battle both his offense's inconsistency as well as his own this season. He'll look to put it past him on the road Week 15 against the Rams. Elliott connected on both of his field-goal and extra-point attempts in Monday's 28-13 win against the Redskins. Analysis: Elliott has now converted each of his last six kicks of 40 yards or longer, including a 46-yarder in the fourth quarter of Monday's game. After struggling with consistency early in the season, the Memphis product hasn't missed in his last five games. Elliott will get to kick indoors in Week 14 on the road against the Cowboys. Elliott was perfect on three field-goal attempts and added one extra point in Sunday's 25-22 win over the Giants. Analysis: After starting the year 0-for-3 on kicks 40 yards or longer, Elliott has now converted each of his last four, including a 43-yarder to win the game for Philadelphia. After struggling to find consistency in the first half of the season, the Memphis product hasn't missed over his last four games. He will try to keep the rhythm going at home Week 13 against Washington. Elliott attempted no field goals and made his only extra-point attempt in Sunday's 48-7 loss to New Orleans. 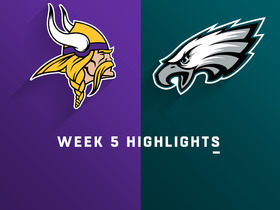 Analysis: The Eagles got absolutely trounced in this one, and the offense never managed to get much going. It marks the second time this season that Elliott has been held without a field-goal but the first time he wasn't even called on for an attempt. The Memphis product has just one multi-field-goal game over his last four but will look to rebound as he goes from the worst matchup for kickers in the Saints to the best one in the Giants at home Week 12. Elliott made both of his field-goal attempts in Sunday's 27-20 loss to the Cowboys as well as two extra points. Analysis: Elliott made his first attempt from more than 50 yards on his third try of the season in the second quarter and tacked on a 26-yarder in the third. He has been perfect in back-to-back games for just the second time this season, a testament to the extent of his struggles thus far. Nevertheless, Elliott is trending in the right direction and has the support of his head coach. 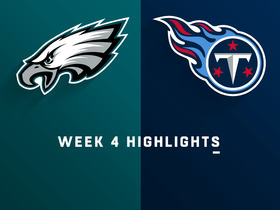 The Eagles offense should give the Memphis product a few opportunities Week 11 at New Orleans. 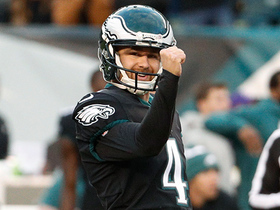 Philadelphia Eagles kicker Jake Elliott drills 35-yard game-winning field goal as time expires. 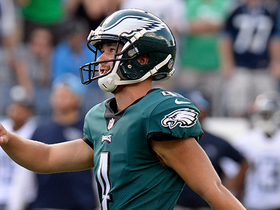 Philadelphia Eagles kicker Jake Elliott's 53-yard Field Goal attempt goes wide right. 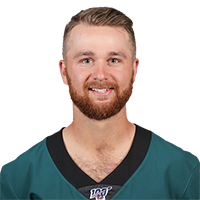 Philadelphia Eagles kicker Jake Elliott hits the go-ahead 43-yard field goal. 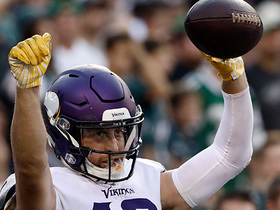 Minnesota Vikings wide receiver Adam Thielen shows ball skills with onside kick recovery. 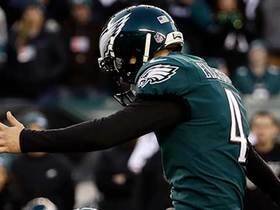 Philadelphia Eagles kicker Jake Elliott makes field goal in overtime to take the lead over Tennessee Titans. 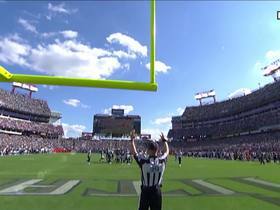 Philadelphia Eagles kicker Jake Elliott makes a field goal to tie the game for overtime against the Tennessee Titans.